Although common, back pain is often misunderstood and left untreated. Athletico continues to develop and train a multitude of Physical Therapists with specific, hands-on skills to provide the most optimal patient outcome. This hands-on technique is often referred to as manual therapy. Our Back Pain Specialists reduce symptoms, identify and treat the source of pain. We believe in providing specificity of care for all conditions and ensure every treatment session is valuable. Athletico Physical Therapists have advanced certification in manual therapy and adhere to evidence based practice principles making the back pain program an excellent treatment option. Athletico is a proud member of the Alliance for Physical Therapy Quality and Innovation (APTQI). Recently, the APTQI conducted a study that provides important evidence that the use of physical therapy early in treatment of low back pain may lead to reduced costs through less utilization of other types of healthcare services, including reduced use of downstream injections and surgeries, among others. 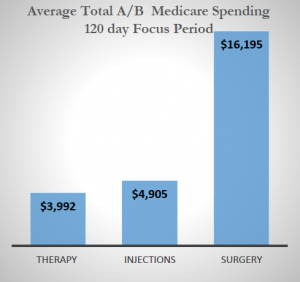 Click here to read more in depth about the study and how Physical Therapy can reduce total Medicare costs. Find a Back Pain Therapist Near You!